Here's one of the otters in the new wing of the Museum of Discovery and Science in Fort Lauderdale, Florida. I was hired by the museum to photograph the interior and exterior of the new building, all of the new exhibits, and of course, the otters! 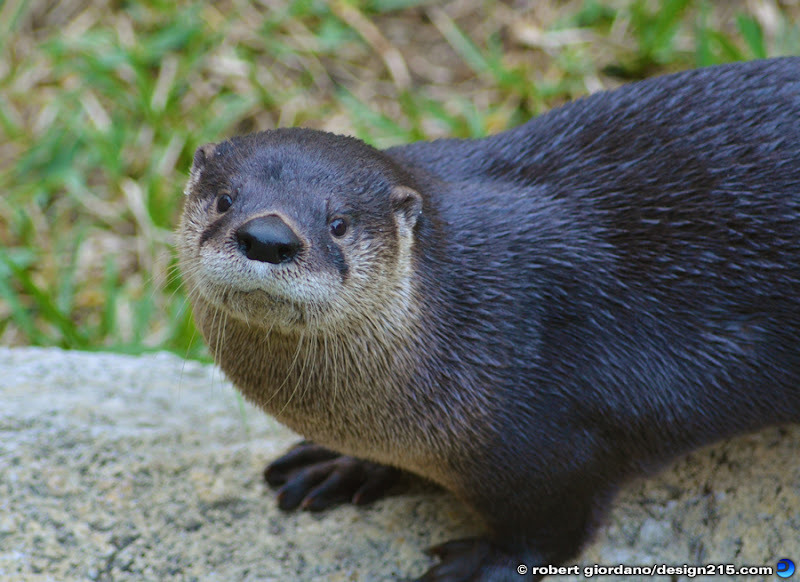 The otters live in an open air habitat with a lake and waterfalls. On the inside of the new building, there's a glass wall where you can watch these playful creatures diving and swimming around underwater. What Do You Think Keeps Him Jolly? That's a good question. I really don't know. I also have no idea what this piece of advertising is trying to accomplish. I remember seeing this in a store window but I don't remember the store or what they were selling. Frequently, I see advertising that goes out of its way to be clever and memorable, yet fails to sell the product. So the question remains. Was it a clothing store? A liquor store? A dentist? An adult video store? Anyone have any clue? This photo was taken with my EVO 4G. Today I installed a camera for a 9 month time lapse of a construction project. The camera is mounted to the outside of a parking garage that faces the building under construction. Just below the bumper of my car, you can see the weather housing I built for the camera. The housing is mounted to a small platform that I attached to the side of the garage. I brought a good selection of stainless steel and aluminum hardware, and I fabricated the mounting brackets on site. 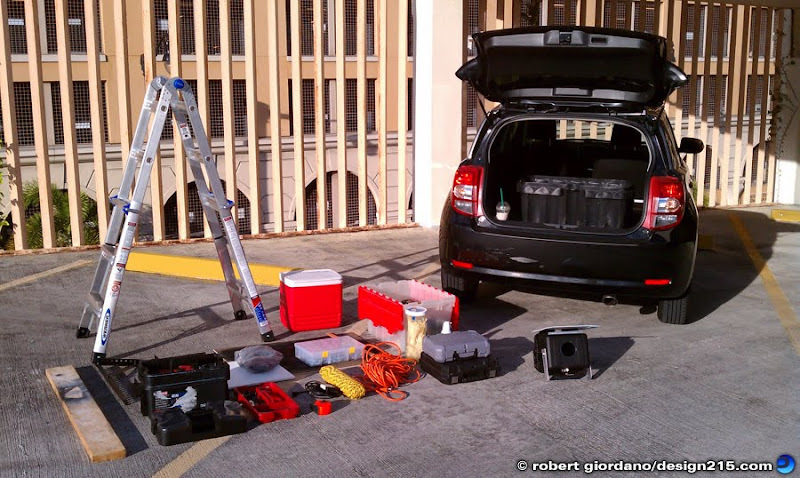 All the gear you see in the photo used to be in the back of my truck. Now it all fits in the back of my car. If you are interested in a time lapse film for any purpose, please contact me at www.Design215.com. In case you didn't already know, QR codes (Quick Response codes) are those funny looking little boxes filled with a pattern of tiny square "pixels". Normally you see them in print advertising and when you scan them with your smartphone, you can receive more information about the product. Here's one on the door of this van. I took this photo with my phone while we were stopped at a light but I think giving people another reason to do something with their phone while they're driving is a REALLY BAD idea! 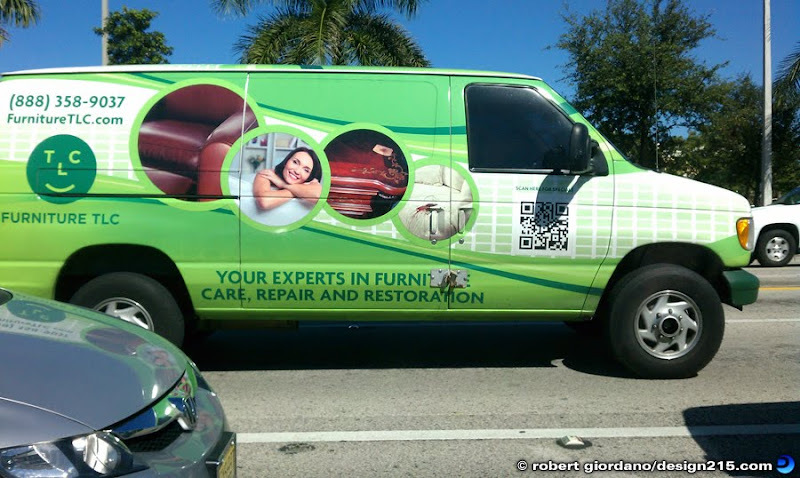 If you agree with me, call the company and tell them to take the QR codes off their vehicles.